The University of California, San Diego (UC San Diego) is one of the top 15 research universities worldwide. The institution is home to over 12,000 staff members working in both the academic and administration sides of the organization. In early 2014, UC San Diego initiated a Strategic Plan that would result in significant changes in every part of the campus and that would impact all members of administrative staff and faculty. 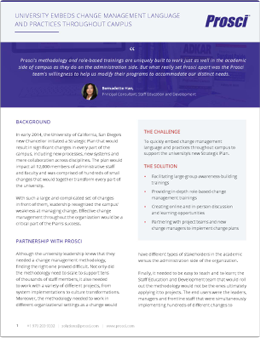 University leaders knew that effective change management throughout the organization was a critical part of the Strategic Plan’s success, and so launched an initiative to embed change management into the organization through a tailored training initiative. To quickly embed change management language and practices throughout campus to support the university’s new Strategic Plan. One of the most impactful things that the UC San Diego Staff Education and Development team did was facilitate several large-forum training sessions on change management. By customizing Prosci’s role-based trainings to fit a large-group training environment, they were able to expose large numbers of staff to basic change management concepts. The success of the broad-reach programs fostered excitement and buy-in from these staff members to engage further with the change management team. Using these trainings as a kick-off to formal change management efforts, the Learning and Development Team continued to build competency in change management through in-depth role-based trainings, hosted webinars, one-on-one coaching and project support. Of the more than 500 staff members that attended the large-group training events, over 90% reported that the trainings provided them with tools and knowledge that could be applied on the job, and over 50% reported that they would use the information and tools immediately. The trainings were particularly impactful to executives and managers, who now have a common language for change. Executives and project teams ask people-related questions and include change management metrics and objectives in their plans. Managers have the tools and support they need to implement change with their employees. Download the full success story to learn about the award UC San Diego won for the large-group trainings, and what activities and trainings the team used to further foster engagement in change. Through an innovative roll-out of training and other awareness-building activities, the Staff Education and Development team at University of California San Diego were able to quickly embed change management language and practices throughout campus.